LMG was one of the foremost nationalists of his era. He rose to Acting Secretary of Foreign Affairs during the Magsaysay Administration. 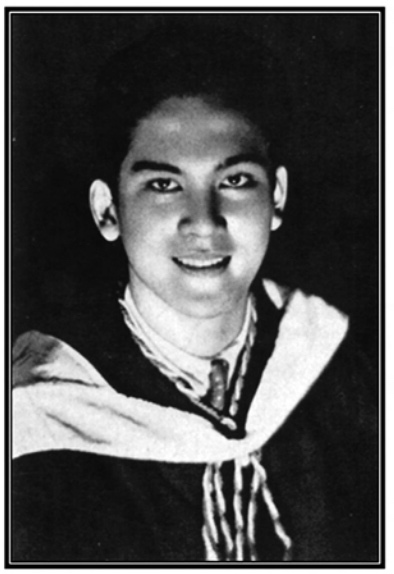 His acclaimed translations of Jose Rizal’s Noli Me Tangere and El Filibusterismo were published in 1961 by Longmans in London. He also completed the award winning biography of Rizal ‘The First Filipino’, done during his time as the Philippine Ambassador to the United Kingdom. In The Philippine Diary Project, he is frequently mentioned in the Bataan portion of the diaries of Felipe Buencamino III. A website dedicated to the author can be accessed at Leon Maria Guerrero. Readers are encouraged to purchase the LMG Anthology to learn more about the author’s life, times, and thoughts. About the diary: This diary comes from a typescript titled “While Tokyo burned,” prepared by the author and completed in Atami, Japan, July 4, 1946, and is used here with the permission of the author’s son, David Guerrero. The diary covers the period January 1, 1945 to August 28, 1945. I have lived in the capital of Japan from the fall of Admiralties to the fall of Tokio. I arrived there on the 1oth February 1944 in the party of Jorge B. Vargas, who had been commissioned as ambassador to Japan by Dr. Jose P. Laurel. My wife Anita joined me unexpectedly on the 22nd September of the same year. She is one-half of the “we” in these columns. From the day of my departure from Manila to the day of the arrival of the First Americans in Tokio I kept up a journal of events and personal experiences, reproduced here with certain omissions afterward noted. My principal extrinsic sources were the censored reports and comments in the Japanese press and the contacts afforded by the diplomatic corps in Tokyo. While much of this material was of necessity suspect as being prejudiced and unreliable, I determined nevertheless to preserve it, if only to record it for future students of history to sift, compare, and evaluate. The omissions in the present publication are as follows. I have omitted those entries which concern activities by various Filipinos, which are still sub judice. I have also omitted bulk of the notes on other East Asiatic regions; these I hope to put together on another occasion, I have concealed the names of most of my sources, both Japanese and foreign; much of the information I received was give in confidence and, although the war is over, its aftermath is not and I should not like to prejudice or embarrass people who were good enough to talk to me freely when it was not entirely safe to do so. I have translated most of the Japanese terms into English. It would have been more authentic and precise to use “haiku” for rations or “keikai keiho” for the precautionary air-raid alarm but it would have entailed a certain amount of difficulty which I would spare the reader. I have consistently used the more accurate term “tokotai” or special attack corps for those suicide pilots better known abroad by the name of one of their units, the “kamikaze”, as well as Yiejima, the Anglicized version which the Japanes-e preferred to the Two island used by the American press. The Japanese weights and measures puzzle me to this day and I am afraid I cannot do any more than to offer here the equivalents given in the Japan Year Book with the hope that they will be of some help. In weights, one “kan” is equal to 1,ooo “momme” which are equal to 3.75 kilograms or eight pounds (avor.) and lo pounds (Troy). In measures of capacity, one “koku” is equal to lo “to” which are equal to loo “sho” which are equal to 1,ooo “go” which in turn are equal to about five bushels and 1.8 hectoliters. With these modifications I should like to emphasize that this journal is published as it was written and it was written on the spot. I must confess to a strong temptation to revise these notes and impressions, especially for publication in the Philippines. It seemed a mockery and an offense to picture the suffering of the Japanese under bomb and blockade to those who had endured infinitely more cruel suffering at their hands. But I believe that, if not for the purpose of understanding the Japanese (and I can well imagine that most of us would just as well have nothing more to do with them), at least as a parable of poetic justice and as a record of common humanity, this journal may have some interest and value. When I arrived in Tokyo in February of 1944 the long dusk of defeat had already stolen over the capital of Greater East Asia. It was still almost a year before the first B-29; under the grudging light of the scattered lamp-posts the restless night crowds still eddied around the sidewalk stalls of Shinjuku; and in the daytime one passed the air-raid trench shelters, open and half-filled with garbage, some covered with a contemptuous cobweb. But for the Japanese the days of the war were already over. The sun of the new empire had passed its doubtful zenith with the glittering conference of Greater East Asia nations in November of 1943. Now Tokyo shivered in the wind of an extraordinary winter, a winter of peculiarly persistent cold. The superstitious were filled with vague apprehensions and forebodings. Four is an unlucky number in Japanese; it is pronounced with the same sound as the word for death; and for those who used the western year, 1944 had not only one of these unlucky numbers but two. It was, so they said, the year of double death. But perhaps it only seemed colder because there was less food, less charcoal, less clothing. Like every other people on the face of the wartorn earth the Japanese were in the grip of a ration system but there was one vital difference; Japan’s system was compelled to distribute not sufficiency but scarcity. And it was total scarcity. It reached even the smallest and most intimate things in life, from matches to sanitary napkins, from toilet paper to electric light bulbs. The Japanese were learning to get along on five cigarettes a day, the official ration, by chopping them up into butts that were smoked in crude holders to the last crumb. They were learning also to get along on one or two bottles of beer a month, if they were lucky. But it was problematical if they could ever get used to freezing, if they could wear their prewar clothes indefinitely, if they could break themselves of the habit of eating. It was in these three fundamental needs, food, clothing, and fuel, that the official propaganda of sacrifice failed to assauge the natural appetite for life. By 1944 it had already become impossible to live on the official rations. The Japanese are a race of heavy eaters, contrary to the legends of their frugality and sobriety; a Japanese doctor assured me that the average Japanese stomach is distended beyond normal proportions by excessive eating and innumerable restaurants in Tokyo before the war gave overt testimony to the national appetite. To such a people the food ration booklet was an intolerable bill of fare. A typical booklet carried the name and address of the head of the household, the number of his neighborhood association, and the name of the district association. It also carried a register of the members of the household and noted the number of persons eating at home and the number eating lunch at their place of work if meals were served there. On this basis tickets in the booklet could be turned in for miso (bean-paste for soup), shoyu (an indispensable salty bean sauce), salt, rice-cakes, matches, wine, sugar, and “extra rations”. These rations did not define what was restricted; they defined what was available. They were all that could be had, when they could be had. For they were not guarantees; they were more expressions of hope. In one year in Tokyo I received about three cupfuls of sugar from my neighborhood association. I can also recall about half a bottle of rice-wine, several bundles of dried seaweed (a standard article in the Japanese diet), and a special New Year’s issue of Japanese rice-cakes. Melancholy indeed were these trimmings for a people who had brought their art of eating to such perfection that dishes were prepared to be admired for color and pattern as well as for taste. Perhaps they could have forgone aesthetics if they could have been assures subsistence, even monotonous and unadorned subsistence. Yet not even this was not to be had from the official rations. Aside from the quota in the booklets the Japanese were entitled to draw rice, fish, and vegetables from ration-distribution centers which released regular allottments to representatives from neighborhood associations. But by 1944 even the starvation quota of 350 grams of rice per person per day was becoming a problem. Never self-sufficient in rice in modern times Japan had long relied on imports from her colonies in Chosen and Taiwan and from rich southern deltas of Thailand and Indo-China for a good 20 per cent of her needs. But the blockade that drew tighter around the homeland had halved the southern imports as early as 1943; in 1944 not one koku was slipping through. Even from the imperial granaries of Chosen and Taiwan the imports of rice had dwindled from 10 million koku to a bare one and a half. The ration already had shrunk from three go to 2.8 to 2.3; now there was talk of its going lower still. Nor was the rationed rice fit for anything but pre-war pig-feed. Not for years had the Japanese tasted, outside of the black market, the large white luscious grains to which they were accustomed; now they must swallow the small dark grains of unpolished rice, mixed plentifully with barley and the dried tasteless husks of pressed beans. Fresh fish had already become a novelty; the supply in the Tokyo market had sunk from 400 tons in June 1943 to 135 in January 1944; two or three small salted sardines were all that could be expected from the normal issue. Vegetables were more plentiful but the supply in the market had already sunk from a typical 33,500 tons in January 1943 to less than 17,000 in April 1944. The people of Tokyo were receiving only an average of 146 grams of vegetables per person per day instead of the 220 of the year before and these were mostly sweet potatoes; only once in a while was there a head of wilted cabbage or an enormous radish to be pickled in vinegar and bean-sauce. Meat if course was a memory whose existence was not officially recognized and perhaps not too poignantly remembered in a Buddhist country. In the wake of these receding rations the people of Tokyo went scouring for the black market. It was a dangerous game, punishable for both buyer and seller, but it paid well. The trains were packed full of grim housewives loaded down with knapsacks knobby with potatoes or redolent of radish. Fishblood dripped from the baggage racks. In the back slits of the green plush seats there was often a tell-tale train of white rice grains. Prices rose implacably. To give one instance, an egg cost 50 sen, then 75 sen, one yen, two yen, until at the end of 1944 it was costing as much as five yen. Those who could not afford to pay these prices lined up patiently at the “national restaurants” and waited for half an hour to get a bowlful of rice porridge or noodles. It was estimated that a million and a half people in Tokyo alone lined up for uncounted wasted hours every noon. Even the official price indices could not conceal the rising cost of living. In August 1944 the Bank of Japan noted that, with July 1914=100, retail prices in Tokyo had gone to an average of 318.7 in July 1944. The Tokyo City Office for its part put the figure at 266.5 with July 1937=100. On the same basis the cabinet bureau of statistics estimated that the index of workers’ living costs (food, housing, fuel, and light, clothing, others) had risen to 173.1 in June 1944. Obviously neither the black market nor the urgent needs that fed it were taken into account in these sketchy statistics. If food was insufficient, fuel and clothing were almost non-existent in the rations. Gas and electricity were strictly forbidden for heating and grudgingly rationed for cooking. An elaborate system of quotas and fines restricted their use to the barest minimum. Not one hunk of coal was available for private use. Most Japanese perhaps did not miss it because from time immemorial their small frame houses had been heated by hand-braziers fed with charcoal. But even this was doled out sparingly. Companion to the food-ration booklet was one for fuel which noted for the information of the authorities whether the household in question did its cooking at home or not, whether it used gas or not, and the area of the living quarters. On this basis allotments of charcoal and or firewood were made, staggered to conform with the greater needs of winter. In our particular case, with two persons in the household, living quarters equivalent to 32 tatami (rice-straw mats used as a unit of measurement in Japanese houses), cooking at home with gas, a basic distribution of five bales of charcoal was allotted, receivable one each in May, August, October, December and January. By 1944 the Japanese were not only hungry and cold; they were also almost in tatters. They were a nation in uniform. It was an odd makeshift sort of uniform but it had made the gay graceful kimono of the tourist folders just as rare as a European frock. By decree the national costume for the man was a closed-collar military tunic and trousers cut from a deep green ersatz fabric of silk mixed with wool and cotton. The original official pattern called for a civilian soldier, trim and egalitarian in a peaked cap and neat olive-drab suit. But he was soon lost in a loose mob of individual preferences and personal necessities. He became an unshaven clerk in a wrinkled and sweat-stained tunic gaping at the neck, worn over a variety of trousers: brown tweed, blue wool, gray herringbone, all the legacies of a more pretentious past. He became a grinning grimy worker with a faded blue Japanese jacket, marked with the bold characters of his trade or employer, falling loosely over the stained and faded uniform trousers, wrapped from the knee in black gaiters and ending in the frayed straw sandals of the poor. In the end only the peaked cap remained as a solitary symbol of totalitarian regimentation. Everyone wore the peaked cap, even the dudes of the Foreign Office in their imported suits. The women in turn wore the mompei, a Japanese version of the over-all, borrowed from the peasant women of the northeast. The basic garment was a peculiarly hideous pair of trousers, tied at the waist with the loose ends of an attached cloth belt, with the crotch somewhere about the knees, and the legs gathered at the ankles. It was deliberately loose, shapeless, baggy, because it was designed to be slipped on over the traditional kimono in case of emergency. This utilitarian mission was perhaps fully accomplished. In trousers the Japanese women could run, jump into a foxhole, leap from a burning building, with greater ease and protection for her traditional modesty; no longer need she make the incredible sacrifice of the department-store salesgirls who, caught by a fire on the roof of their establishment, had preferred to die rather than jump and show their legs. The mompei also gave the Japanese women a new air of briskness end energy; by 1944 she had lost much of that peculiar mincing pigeon-toed carriage that was the only one possible in the tight cocoon of the kimono; she walked instead with a brave new stride, hands in pockets she had never known before. The mompei was perhaps more versatile than the male costume. It could be made and was, in most cases, actually made over from an old kimono and although the garments thus chosen to be converted were usually the woman’s oldest, most worn-out, and least attractive, still the effect was one of greater variety in color and pattern. Eventually the mompei ceased to be a mere cover-all and become the basic garment by itself. Modern and daring girls experimented with close-fitting models that were attractive enough or else discarded it altogether for the trousers of husbands and brothers remodelled into slacks. But the average Japanese girl confined her attempts at coquetry to a careful copy of outdated Hollywood hair-dos (the page-boy was one of the most popular). It was too dangerous to be pretty or smart. A prim and disapproving social worker might hand her a card of reproof or some patriotic male might, in a crowded streetcar, insult and slap her. Whatever beauty the Japanese girl retained in 1944 was shy, stolen, half-apologetic, half-defiant; it was a dingy white silk blouse with a frayed collar peeping forlornly over the edge of a stained jacket; it was a gay lace glove with the thumb worn through. Anyway what could one do with 50 cloth-ration points a year? The cloth alone for one kimono cost 36 points; its sash, 12 points more; and the various layers of underclothing boosted the total hopelessly beyond the limit. Even the simpler mompei required 30 points, And then there were still the allotted two pairs of split-toed socks, one towel, and thread, for all of which points were also needed. Extra points could be had in the black market at one yen per point but they were never plentiful until there was really nothing to buy with them. This rock-bottom had just about been reached by 1944. There had never been any possibility of men’s woolen suits being available through legal channels; now the stores were cleaned out of even the poor scraps of merchandise still left. Entire floors in the great depatos (department stores) were closed down; in the remainder the glistening glass cases were padded with prints curios, flower vases, odds and ends that nobody wanted to buy. Before the war a man could have gone in naked into one of these giant establishments and come out fully dressed; now, even with all the points in the empire, he would be lucky to emerge in an imitation felt hat and an olive-green necktie, with possibly a cheap silk scarf tied around his middle. The Japanese were living in their pre-war clothes, their pre-war underwear, their pre-war shoes, and a brand-new peaked cap. Somehow the cap, symbol of both sacrifice and the meager fruits of sacrifice, summarized the war for the Japanese. But shoes were also a good index. In the streetcars in Tokyo everyone stared at everyone else’s shoes; good shoes were the signs of either a foreigner or a war profiteer. Quotas were not uniform throughout the country but every Japanese was supposed to reiceive one pair of wooden shoes a year. There were none to be bought, whether wooden or leather, in the legitimate market. In some localities there apparently had been an issue of cheap canvas shoes, once during the war; it had never been repeated. It was obviously impossible to get along on one pair of geta a year. Japanese women prefer to wear the lower, more comfortable straw sandals called zori for short distances while the men find leather or canvas shoes more convenient. But these were wartime luxuries in 1944; a pair of zori at that time cost as much as 30 yen in the black market, they would go up to 75 yen and even 150 yen for a really good pair. Shoes were not only expensive (300 up to 1,000 yen); they were almost impossible to find. Rude clumsy boots nailed together from tough yellow leather only partially cured, were sold under the counter for outrageous prices. Shoestores were selling only imitation leather wallets and handbags and a few leftover jars of shoepolish. It was difficult to buy even shoe-strings; one had to search for hours along the sidewalks of the Ginza before coming across a bunch of cheap cotton or paper strings, dangling before a curb stall and going fast at one yen apiece. Here in these sidewalk stalls was laid bare the story of empire in 1944, for all who passed to read and remember. This was all the booty of conquest that had reached the wretched threadbare people who had paid for it with their blood. One could judge the extremities of scarcity from these jumbled odds and ends that had suddenly grown so valuable: celluloid shoehorns, imitation leather soles, tiny colored Christmas-tree bulbs, stacks of gay-patterned wrapping paper, wooden buttons with the green paint peeling off. The tired men and women with the quick restless eyes shuf­fled past, paused to peer over some shoulder, and went on. There was nothing to buy, nothing one really needed like a frying-pan, an electric light bulb, a set of underwear, nothing but the evening paper with the ambiguous headlines and even that was going off the stalls. There was nowhere to go. The beer-halls, cafes, and bars, so many that once there had been one at every corner, were locked up; the geisha were in the factories; the moving-picture houses were limited to one theather per district, one film per month, one or two performances per day. Here and there, if one knew the way, there might be a noodle shop or a tawdry little parlor serving watery grape-juice. But the patient queues were already so long in the bitter evening. Life was no fun anymore; it was “tsumara nai”. But it was also “shikata ga nai”, it couldn’t be helped. These two phrases, the most popular in wartime Japan, told the story of the war. Only an unbelievable patience, a fatalism that was almost despair, enabled the Japanese to submit and to survive. Yet even this dumb disciplined people was already cracking under the strain; one could see it in the little things: in the garbage strewn about the subway stations, in the festering sores on the face, of a baby. The Japanese had once been noted for cleanliness and honesty. But now slippers were stolen from the racks at the doors of bath-houses. The lowliest cobbler had to be tipped with cigarettes to nail on a new sole, passengers in streetcars snapped at one another and quarreled violently over a stubbed toe; before the war they would have apologized profusely. They were making their discontent felt in more significant ways. The workings of Japanese government had never been very clear even to the Japanese. To a foreigner they were beyond comprehension. Here was a dictatorship without a dictator, a fascist state without a party, disorganized and inefficient totalitarianism. There appeared to be a government by cliques, cliques of rival warlords who had taken the place of rival, bureaucrats, politicians, and millionaires. They alternated in power through intrigues and palace revolutions that seemed incredibly remote from the common people. But the war was showing more clearly where the real power lay. The cliques did not make the crises; these rose deeper from the dark tides of popular discontent. The cliques only rode each succeeding wave. Now the waves were coming higher and more frequently. Hungry housewives had forced To jo to change his agriculture minister early in 1944 to one whose slogan was “eat before fighting”. In the end it was they who had forced out To jo himself rather than the jealous generals and resentful admirals who grumbled at dictatorship by someone other than themselves. Political gossips and diplomats might talk knowingly of fundamental disagreements about strategy (To jo wanted a land campaign in China to clean up the B-29 bases; the navy wanted an oceanic campaign to save Saipan and future B-29 bases); of competition for airplane production (To jo had grabbed the lion’s share of the new planes for his China adventure and had condemned the navy at Saipan to join a hopeless issue without air protection); of delicate but insoluble problems of jurisdiction between the administration and the high command (To jo had tried to solve them in the end by combining in himself the posts of premier, war minister, munitions minister and chief of staff). But the rival warlords who had doomed To jo by refusing to serve in one last national cabinet had only read and followed the signs of popular discontent. Not all the younger officers who idolized the Premier General could save him from the anonymous but irresistible revulsion of the people against defeat and scarcity. But the tragedy of the Japanese people was that they did not know how to get what they wanted; they did not even know what they wanted. Things seemed to go only from bad to worse in the year of double death. They were working as hard as they could. By 1944, according to the official figures of the To jo commercial and industrial economic association, the daily average of work in Tokyo was 10 hours. But many workers stimulated by patriotism were already living beside their machines, going home only once a week or every 10 days. Everyone was working. Almost 13 million men and women had been drafted for the factories, including a million and a quarter students, half of them schoolgirls. Since 1937 they had been doing “labor service”, first in farms and charcoal plants during summer vacations; then from October 1943, for one-third of the year in munitions factories, barracks, farms, and defense works. Now at the start of 1944 all students gave up their schooling entirely to man the machines. Almost every house had its own small part in the war effort, sewing uniforms, folding parachutes, making cartridge belts. In Tokyo there were few blocks without at least one machine each, even if it was only a lathe. It was difficult for the Japanese to understand why even with these prodigious sacrifices and unstinted efforts there never seemed to be enough, why the long-awaited long-postponed decisive victory had not been won in Saipan, in the Marshalls, in Leyte, or why the supreme sacrifice of the special attack corps, the suicide pilots so perfectly named after the kamikaze, the divine wind that had swept the Mongol armada from the shores of Japan, had failed to turn the tide. It was easier to believe the official assurances that the time had not yet come, that the army and the navy were only waiting for the favorable opportunity, the “divine sure-victory opportunity” of winning the war at one stroke. A shudder, not of horror but of pride, had run through the empire when the exploits of the suicide tokotai had first been announced. Suicide had neither shame nor terror for a people taught to believe that a soldier called to the colors were already dead to father and mother, wife and child, to anyone but the emperor to whom his life belonged. A pilot who dove to his death was only an altar-shelf above the common soldier, taught to die rather than surrender, to fight to the last. The Japanese took their battle-cries seriously; for them every skirmish was an Alamo. This was the answer of their unique racial spirit to those inexhaustible assembly lines that had refused to disintegrate in frivolity and classwar: one plane for every ship of the enemy, one man for every thousand. It was therefore with an odd and touching faith that the Japanese entered the new year 1945. The battle was hard but they would win it still; suicide would thwart and conquer science, spirit would overcome the machine. Every man a member of the national tokotai, was the cry that was already beginning to be heard and the common people, not perhaps the wiseacres and the professors and the barons, but the riveters, the farmers, the railway porters and the schoolgirls, were proud and eager to take their places in the line. The bombing of Tokyo would be their personal battle. As early as March 1944 short practice blackouts lasting for a few seconds had warned the people of Tokyo to brace themselves for the ordeal. As early as the beginning of summer short alerts had been sounded when China-based B-29’s raided the steel plants in Fyushu. In the streets of the capital posters were shouting the prophecy: “prepare for air-raids! The enemy is sure to come!” Some of the sidewalk stalls along the Ginza were hanging up artificial limbs for sale, in elegant whore-house assured its customers: “Safer during bombing”. When the first B-29’s came over in November for a brief reconnaisance the crowds, scrambling out of the shelters and slapping the soggy leaves of autumn from their coats, felt a little foolish. They should not have run away; nothing much had really happened; they wanted desperately to feel like those Londoners they had heard about who had stuck it through the German blitz with stolid confidence. Even when the alerts and the alarms shrieked more frequently, a long-drawn-out wail for the warning, a series of short blasts for the actual attack, a clanging of gongs and cymbals by the local warden for planes directly overhead — even when they were whistled out of their mattresses in the middle of the night into the dark and freezing trenches, they felt that Mr. B-29 was a nuisance rather than a threat. In 1944 they could still laugh at him. They thought they knew how to handle Mr. B-29. Open all windows, they had been told, to save the glass from blasting. Cover the trenches with an earthen roof and an old mattress or two. Cover the head wit a helmet or a quilted hood. Warm up the small red hand-pump. Get the sandboxes, the rope-ended staves, the hooks, and the pails, ready. Kill the incendiary bombs with a spadeful of earth. Nothing to worry about, nothing to fear. It was a little overdone. The authorities, more than a little nonchalant themselves but conscientiously worried, were soon to run into difficulties persuading people to move out of Tokyo in line with the dispersion program. It would be puzzling to handle the child-like curiosity, the child-like faith of the Japanese people. They were hungry and cold in their threadbare uniforms but they were not afraid. They did not know too much about the way the war was going. They did not need to know. The invincible navy was waiting for the second battle of the Japan Sea, the deathless pilots of the tokotai were riding the divine wind across the islands of the Philippines, the war might be going badly for a while but it was far away, God was in the imperial palace, all was right with Japan. Note: There is also an epilogue to the diary by the author.